On Sunday March 27th more than 200 people visited the Spring Bay Maritime & Discovery Centre Inc at Triabunna to view the remains of a convict built vessel pre dating 1840. Officially opened by MLC Tanya Rattray at 11.00am, the ceremony was attended by representatives of many organisations who have combined to recover and preserve the remains. Among them the National Maritime Museum, Parks & Wildlife Tasmania, The Wooden Boat Guild, TMAG and Heritage Tasmania, the Foundation of Regional Renewal, the Triabunna IGA Supermarket and Maria Island Ferry operators John and Anne Colecook. 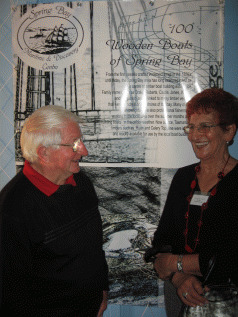 Tasmanian seafarer Bern Cuthbertson was on hand to discuss the exhibit as were several other living legends of the Tasmanian wooden boat building industry in Bernard Wilson, John Castle and Malcom Ferguson. Local identity Mr Stan Haig provided the voice over for a 3 minute video describing the recovery of the boat pieces – Stan’s family is one of many with long time connections having lived on Maria island. Centre President Noel Burnell was delighted with the interest shown which he said was the best reward for the small but hard working SBM&DC membership who had risen to the challenge to stage the event. Other attractions included the Hobart Historical Machinery Society display of vintage machinery and restored farm tractors as used by early settlers, Geoff and Dianne Rowlings amazing display of 70 years of outboard technology, musical instrument manufacture, WW2 military vehicles and models, a range of wooden boats including Wally Mausers steam powered outboard and a pristine gaff rigged sailing dingy kindly loaned by Lloyd Clark from Innkeepers. The Spring Bay Maritime Discovery centre is a not for profit community venture commenced to collect and honour the history of the Maria Coast region and to nurture the future by telling the stories of our forebears. Committee member Jim Playsted said raising the profile of the Maria Coast region and creating an avenue for skills transfer from older members to local young people was among the SBM&DC goals. With the demise of the forest industry pending he said the creation of the Spring Bay Maritime & Discovery Centre was a ‘hand up – not out’ effort by local people to invent a piece of their new future for the town and help promote Maria Island visitor numbers in particular. Potential donors or members of the public can contact Jim Playsted on 0437 222600 for information about how to help the Centre grow and prosper.